The ground, opened in 2000, is situated spectacularly under the Castle Rock. It currently comprises of one stand which sits at one side of the pitch. However the stand is of a fair size, is covered and all seated. The space & height between rows is ample, giving fans a good view of the action. 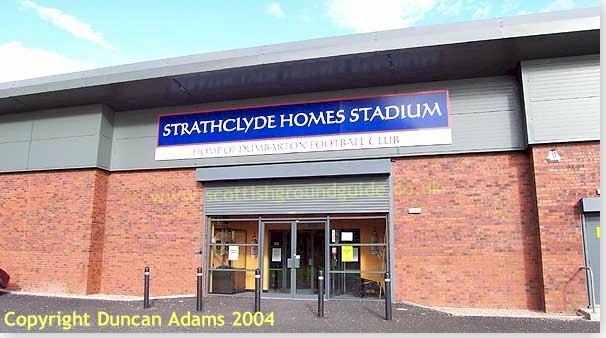 One unusual aspect of the ground is that the team dugouts are on the opposite side of the ground to the dressing rooms and this results in a large procession at half and full time. The ground was built by Barr Construction and there is plenty of space around the area, which could be used for future expansion. David Carson adds; 'most fans refer to the ground name as being The Rock Stadium'. 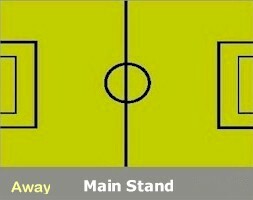 Away fans are situated in sections one and two, at one end of the new stand. Around 500 fans can be accommodated in this area. As you would expect from a new stand, the facilities are good and you should experience a hassle free day at the ground. The nearest bar that I could find was in the Rock Bowling Club, which is just a little further down the road from the ground, opposite the entrance to the castle. Otherwise there is the Stags Head, situated opposite the entrance to East Dumbarton station. It is a good sized bar, with TV's and pool table, but unfortunately does not serve fans wearing football colours. Castle Rock dominates the Dumbarton skyline, and with the ground sitting just beneath, it is fairly easy to find your bearings. Follow the A814 into Dumbarton and just after you go under a railway bridge, you will see a sign pointing left for Dumbarton Castle. Turn left here (Victoria Street) and the ground is down the bottom of this road on the right. There is a fair sized car park at the ground. Dumbarton East station is only five minutes walk from the ground. As you come out the station turn right along the main street, left into Victoria Street and the ground is down the bottom of this road on the right. For the Dumbarton fixture list click here (to take you to the BBC Sports Website). Division Three, April 27th 2002. 18,000 v Raith Rovers, 1957. If you require hotel accommodation in the area then first try a hotel booking service provided by Football Hotels who are powered by Activehotels, who specialise in locating accommodation near or within a short travelling distance of the football ground. They also have the added advantage over some other hotel booking services that you pay on departure. Yes this site will earn a small commission if you book through them, but it will go to help with the running costs of keeping the Guide going. To access their Dumbarton page click here.